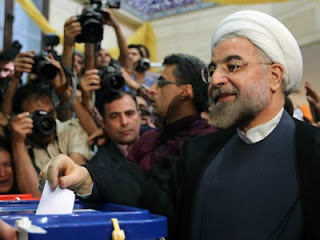 Following Iranian moderate cleric Hassan Rowhani's presidential win, world powers offered a cautious welcome on Saturday. Amid concerns over Tehran’s nuclear program, the United States said it was prepared to engage Iran directly over its disputed nuclear program. The White House said such engagement would be aimed at reaching a “diplomatic solution that will fully address the international community’s concerns about Iran’s nuclear program,” AFP news agency reported. 64-year-old Rowhani has previously vowed to restore diplomatic ties with the U.S., which cut relations in the aftermath of the 1979 seizure of the U.S. embassy by Islamist students. Israeli Prime Minister Benjamin Netanyahu on Sunday urged continued international pressure on Iran to curb its nuclear program after the election of the new president. “The international community must not give in to wishful thinking or temptation and loosen the pressure on Iran for it to stop its nuclear program,” Netanyahu told his cabinet, according to a statement released by the Prime Minister’s Office, Reuters reported. Meanwhile, Russian President Vladimir Putin congratulated Rowhani on his victory. “Putin expressed confidence that Hassan Rowhani’s work on this high post will promote the flourishing of (Russian) friend Iran and further strengthen Russian-Iranian relations,” the Kremlin quoted Putin as saying in a message to Iran’s president-elect. “The Russian president also confirmed his readiness to advance the development of mutually-beneficial cooperation with Iran in various fields, in the interests of regional security and international stability,” the Kremlin statement said. Gulf States also congratulated Rowhani; “we look forward to working together for the good of this region and the Emirati and Iranian peoples,” the UAE President Sheikh Khalifa bin Zayed al-Nahyan wrote in a telegram to Rowhani, state news agency WAM said on Saturday. “We are keen to forge relations based on cooperation with the Islamic Republic of Iran,” he added. Meanwhile, EU foreign policy chief Catherine Ashton said she was committed to working with Rowhani to find a “swift diplomatic solution” to the disputed nuclear program. U.N. Secretary-General Ban Ki-moon urged Iran to play a “constructive role” in regional and international affairs, his office said in a message congratulating Rowhani and welcoming the reported high turnout. French Foreign Minister Laurent Fabius said Paris was “ready to work” with Rowhani, and said the country’s nuclear program and its involvement in the Syrian conflict would be high on the agenda. Italian Foreign Minister Emma Bonino said Italy hoped to launch a “relationship of renewed comprehension and constructive dialogue” with Iran after the election of its new president. But Israel said it was supreme leader Ayatollah Ali Khamenei who determines nuclear policy, not the president. “After the election, Iran will continue to be judged by its acts, in the nuclear field as well as that of terrorism,” a foreign ministry statement said. The Jewish state, the region’s sole if undeclared nuclear power, has not ruled out a military strike to prevent Iran developing an atomic bomb. Meanwhile, the key opposition Syrian National Coalition called on Rowhani to review support for Syria’s President Bashar al-Assad. But Hezbollah leader Hassan Nasrallah, an ally of the Syrian regime, congratulated Rowhani. “As we congratulate you and ourselves, too, on this decent and wonderful election, we turn to God Almighty ... to bless you and support you and make you able, through a government of hope, to achieve all the hopes,” Nasrallah said in a message to Rowhani, The Daily Star Lebanon reported. “We in Hezbollah-Lebanon, and with us all the Mujahideen [fighters] and this resistance country, offer our blessing on the occasion of winning deservedly the confidence of the great nation,” Nasrallah added. At home, the supreme leader hailed Rowhani on his victory. “Congratulations to the people and to president-elect Hojatoleslam Hassan Rowhani,” Khamenei’s website reported. Rowhani scored a landslide victory over his conservative rivals without the need of a second round run-off, Interior Minister Mostafa Mohammad-Najjar said on state television on Saturday.